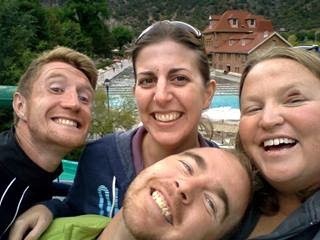 Teachings and Travels: Catchup time!! So I am back! Apologies for the absence. I was enjoying my travels over summer so much I did not have time to update once I was on the road with my parents! So much to see and do and catch up on :-) Hopefully you all were able to see my photos though. I posted links to the Shutterfly photo albums I had made up of my 10 week summer vacation. If you have not seen my awesome trip through pictures, please feel free to have a look at them - they were in the previous three posts. Any question, send them my way - basically though it was a fantastic whirlwind trip east, west, south and north of the whole country! A new school year started on August 5. That week was purely teacher only - we had two days staff development meetings, one day with the entire district staff and then two days in our own rooms and with our teams. This semester I am teaching Math to all fourth graders instead of writing. We have a new team member in fourth grade and she has taken over the Writing syllabus while Theresa (and me until December) is taking over Math. One thing I noticed straight away is the difference between teaching Math in a Title 1 school in Colorado and teaching Math in Victoria. Due to the transient nature of the Title 1 school population, state scores and the low socio-economic nature of most of the school community, our school is directed by the District to teach a particular syllabus following a pacing guide for the year. This allows students who move from school to school to continue their learning at the same place in the syllabus. This is different to how I was teaching in Victoria with our continuum framework of skills we teach as students need. A change but it is an exciting one to see how another school and district looks at the development of student mathematical understanding. to make it easier to keep organised!! Since August I have introduced Math Workshop to the classes. The students have a bit more independence in getting their work done and I am able to meet with small groups every day. It has been a struggle in some areas developing this independence but the students really seem to enjoy the rotations: Teacher Choice, Math Facts, Hands On and At Your Seat. School has also been interesting as we began - I participated in a drill Lockdown situation for 10 minutes, which was followed up one week later by an actual Lockdown situation (on September 11 too!) that lasted 25 minutes and was ended by a GJ policeman unlocking my door. Kinda scary and weird - am looking forward to not having to go through these again when I go home!! I had travelled for so long over summer break - 8 1/2 weeks of the 10 weeks I was on the road away from GJ - that it was extremely nice to get back to school and stay in the one spot!! I spent August and the start of September getting back into the swing of things at school and spending time with my awesome friends. 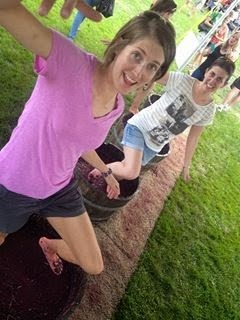 Katie and I stomping grapes! It was really cold and gross! Our gorgeous feet when we finished! Our first bottle bought and drank with lunch! We loved this label :-) Very fun! The weekend following, there was a CITEL Grand Junction Weekend. A lot of the Aussie exchangees and some American ex-echangees came over the mountains (from the east and south) to stay in town and check out some of our wonderful local areas. 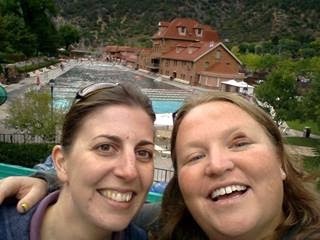 Fiona, one of my friends in Denver (from Sydney), came over and spent the weekend with me. 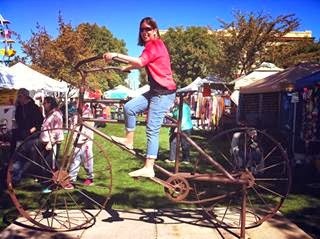 Together with Sara, we spent Saturday at the Fruita Fall Festival, which is a town festival on the other side of the valley. 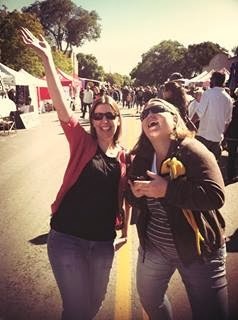 It was a great day that began with breakfast at the Dickes', watching the town parade, wandering the stalls, spending money (I bought Xmas presents and a Colorado Love hoody) and having lots of laughs in the beer garden area in the afternoon. 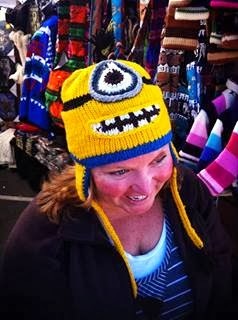 Sara bought an AMAZING beanie - Minion Time! Fruita has a lot of sculptures around the town square, just like Palisade! On September 29 I headed to Monument Valley to meet up with the McLean and Hewitt families. 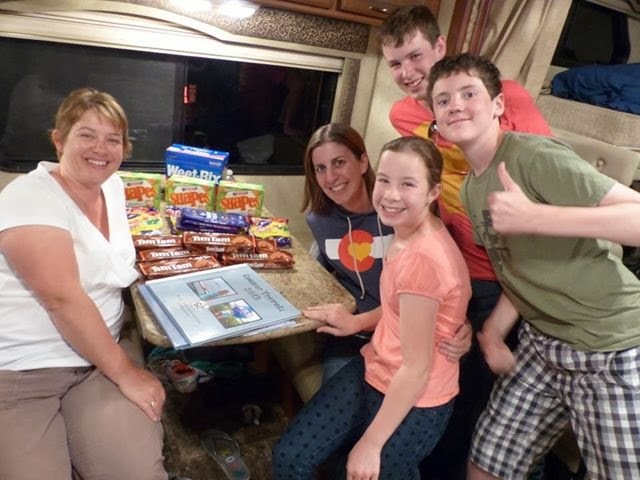 They were travelling the National Parks for a few weeks in RVs and we had organised to catch up this night for dinner. I was looking forward to seeing people from home! Anyone want to run a marathon? This rock was balanced very well! as I got closer to the Arizona border! Driving through Utah ...... different landscapes only half hour apart! What a great way to relax and unwind - looking at the gorgeous scenery! I even got an amazing present!! :-) Yummo!! There is much more to come, including my drive back from Monument Valley where I visited Four Corners Monument and the Needles district of Canyonlands National Park. However, its time to post this catchup before it gets TOO long!